Three things 'Smart Home' Brands Can Learn from Apple... and Why. The Smart Home. A booming industry full of big opportunity. By 2019, it will reach $490 billion in sales and over 1.8 billion units shipped. So, in 3 words: Booming. Big. Billions. Who doesn’t want part in that? BUT (another B) - Mintel reports that a vast majority of consumers are unaware of smart home brands. Only four connectivity brands carried double-digit awareness in a report released earlier this month. So, why is the outlook so strong and general brand awareness so low? And Sarah was not the only one making a direct connection between ‘the Connected Home’ and Apple. We’re talking about the brand that created consumer connectivity and this “always-on” culture. Of course, they’re going to have the consumer’s trust. It challenges every brand in the space to beg the questions, "Is our product as intuitive as the iPhone? Dare it be better? Can our design and interface compete? Can our service? Our experience? Our message?" These are questions beyond just integrating with Apple devices. It challenges every brand in the space to think about how they compete with the things that make Apple irreplaceable. So what can we learn from them? 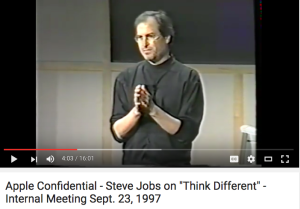 If you’ve never watched this video of Steve Jobs presenting the “Think Different” campaign to his internal team in 1997… It’s worth your time. He talks about how they are going to bring Apple back to greatness by re-focusing on the basics: great products, great marketing, great distribution. The focus on marketing is not to be overlooked. Here, you’ve got one of the greatest technology companies and innovators in the world talking not about the product, but the message. A product is only great if customers believe in it, invest in it and become loyal to it. No message? The wrong message? The product will not succeed. Even if it’s the best. In this great market transformation, this is the big challenge. Everyone is trying to prove why they are still relevant and how they will continue to be. But what can be learned from Apple? Go back to the basics: Focus on the core. Great Products. Great Marketing. Great Distribution. Invest in your Brand: Invest in building a brand that people can trust, that makes them feel something. Don’t be Greedy: Create a product eco-system and experience that works best for your customer, not just your brand. Be smart about closed and open eco-systems, what should remain proprietary and what should sync. Start and end with the customer. Every. Single. Time. KSV, a woman-owned and Certified B Corporation, is a marketing and advertising agency with offices in New York, Vermont and Rhode Island. For nearly 40 years, KSV has partnered with clients whose missions help drive an effective and more sustainable future. 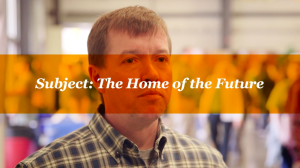 The firm’s marketing expertise is primarily focused on energy, energy efficiency and the connected home.